With the development of infrastructure, the amount of sand of a substantial increase. In order to protect the environment, natural sand mining is prohibited, instead of that artificial sand. The main raw material for the production of sand are pebbles, river gravel, limestone, granite, basalt and other minerals, where pebbles, river gravel and limestone are the most commonly used raw material in sand production. 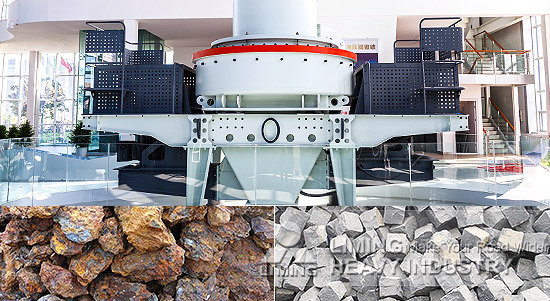 However, although pebbles is an ideal green building materials, but it still needs crusher, sand making machine and other equioment to process the piece of hard pebbles into a certain size sand, and then used in building materials production. pebbles ore is relatively large, during the process, it can not be one-time large scale stone crushed. It needs to go through two crushed, to achieve the required stone, sand particles. Pebbles hardness is large, the crusher equipment wear will be serious. So we should choose small wear, large capacity, long life jaw crusher+VSI5X efficient vertical sand making machine as processing equipment. Jaw crusher+Impact sand making machine, the two short selection process makes the whole sand production line simplification. Compared with VSI sand making machine, the sand rate of VSI5X sand making machine up to 60%, the rotor is almost no wear, and imported manifold, other wearing parts all have long life, so that the entire Sand production line costs is reduced. Pebble crusher and sand making production systems has been widely used all over the world.